There's something wonderful about curling up with a good book. Don't get me wrong: I thoroughly enjoy reading eBooks, but I also savor the physical sensation of holding an actual book in my hands, turning its pages, and closing it, slowly and with satisfaction, upon completion of the final lines. 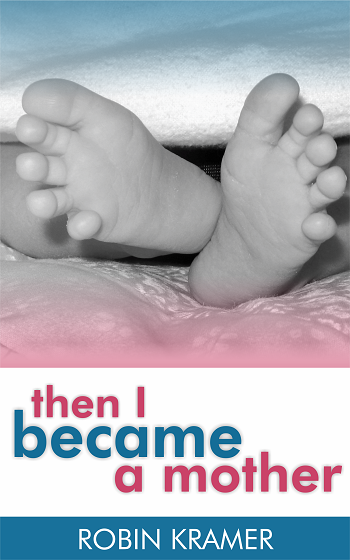 This is why I'm delighted to share that hard copies of Then I Became a Mother are now available through Amazon! The way Robin weaves her advice with humor and experience is delightful. The perfect read for those days that you wonder if you are doing anything right. Kramer imparts wisdom, maturity, and humor in her writing. If you need a pick-me-up or a good reminder that you are not alone, this is a must read! Hysterical and spot on! Then I Became a Mother is a must-read for every expecting mother, new mom, or any mom of young children. Kramer has an uncanny ability to use the written word to mentor a mother's heart. Her writing style is as intimate and genuine as having coffee with a dear friend. Then I Became a Mother captures the essence of the mothering experience certainly more than any other book I've read. I wish I could give this to all new parents... We are not as alone as it can feel. Thank you, Robin, for writing this and giving voice to many shared feelings and experiences. Check out Then I Became a Mother -- a gift for you and the moms you love! Congratulations! That is really great news! I know you must be so thrilled! I have some friends pregnant with their first who may enjoy this!